The death of Scott Fitzgerald recalls memories of a queer brand of undisciplined and self-indulgent brats who were determined not to pull their weight in the boat and wanted the world to drop everything and sit down and bawl with them. A kick in the pants and a clout over the scalp were more like their needing, but all of us were more or less goofy then, so they enjoyed a very tolerant public, whose sympathy and attempts to understand only encouraged them to eat more live goldfish out of the hotel fountains and whine all the louder. The sensitive young things of whom Fitzgerald wrote and with whom he ran to fires, not only because he could exploit them as material for profit in print but because he found them congenial, were fond of a belief that they had been betrayed by some impersonal mass-rouge called their elders who had wantonly and just for the hell of it caused an awful war and the ensuing upsetment and that they, most of all, were the victims of this villainy. Some were veterans of the war, but more were of the group who came of age just after the peace, but we were not taking polls in those days, so we never knew how many they were all told and many insist, if we like, that the noise they made was far out of proportion to their numbers. After all, there are now living among us millions of men and women in their high 40’s and late 30’s who were members of that age group and who settled down to work and the responsibilities of life and do not concede that they ever lost their souls. 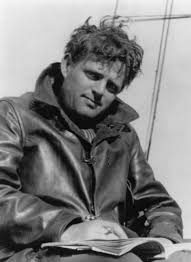 Of that group or cult of juvenile crying-drunks I have in mind one in particular who obviously seized upon Fitzgerald’s writing as an excuse to run his fingers through his pretty, wavy hair and flout every ordinance of morality, responsibility, respectability and manhood. The persons of that age in the European countries did suffer from confusion and lack of opportunity, and the despair of their elders is a much different proposition. Here, after a very brief pause, life picked up and opportunity not merely beckoned, but just about ganged the young. As to the kind of opportunity, whether to serve mankind in some large, permanent, altruistic way or merely to prosper economically and pursue in reasonable security and comfort the devious but inevitable path from the cradle to the grave, it is not pertinent to ask in a discussion of Fitzgerald’s lost generation. He dealt with a group who were not noticeably concerned with noble service but merely petulant, because no one had invented a gin that didn’t cause hangover—another grievous failure of the wicked and shiftless elders. At this distance from Fitzgerald’s day there are signs that, just as saloon society is exaggerated and overpublicized at present, so then the number, importance and plight of his subjects were vastly magnified. Where are they now, those flappers, male and female, whose problem never was hunger or lack of a job, or rather luxurious comforts, but just a yearning and churning such as every youth is troubled by, but in their great self-pity thought all this was something new? They are not next door, because there were not enough of them to provide neighbors for us all, even discounting the mortality of almost two decades. Whoever sees one now or knows of one who wouldn’t have been a malingering flop and whiner in any generation? At this point it may be observed that today any legitimate, conscientious effort to regard youth as a section of society and to give special encouragement and aid is certain to be exploited by a relatively small element of youth who will turn pro, so to speak, and either sit down on the curb and quit cold or hop up on a ladder-box and damn the only system under which they are permitted to do so. The majority are minding their own business, preserving their self-respect and their individuality as the majority did when Scott Fitzgerald’s few were gnawing gin in silver slabs and sniffing, about the sham and tinsel of it all.